The last day of class ends between 3 - 5 PM. Frequent breaks are given and a 1 - 1.5 hour lunch. The training room is open during the evening time for additional practice (optional.) 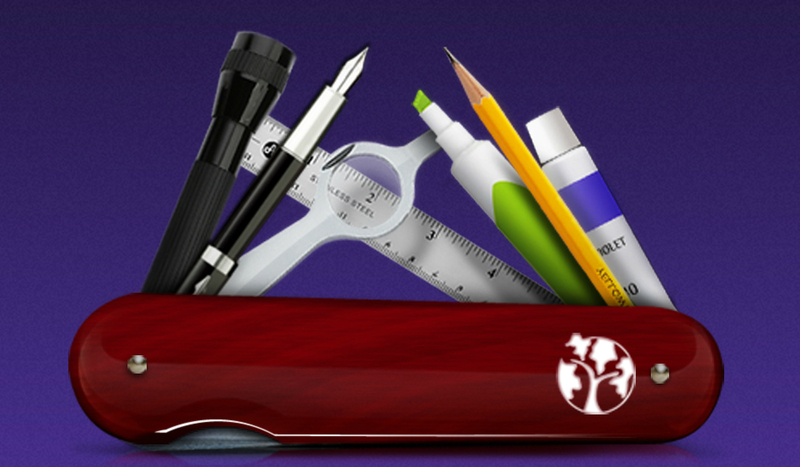 These sessions may become mandatory for challenged students in order to certify. 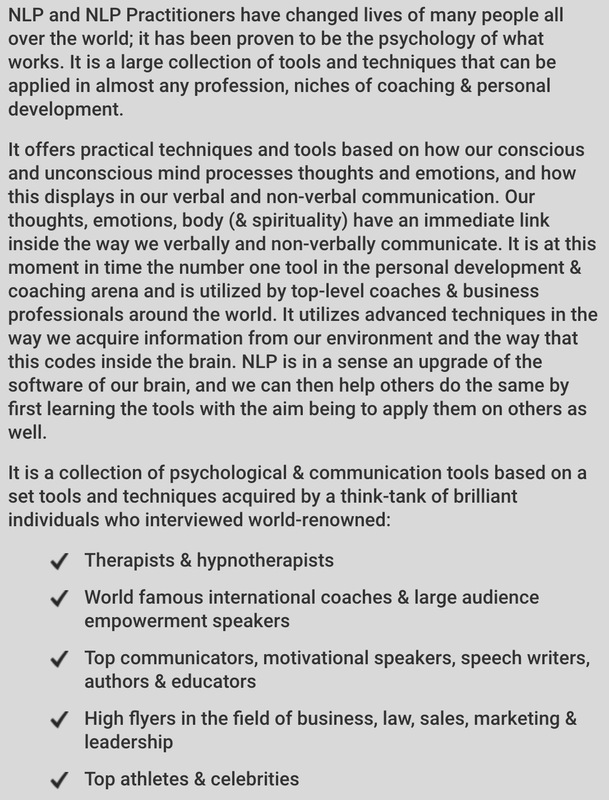 The following is the Global NLP Training course outline and tentative schedule. 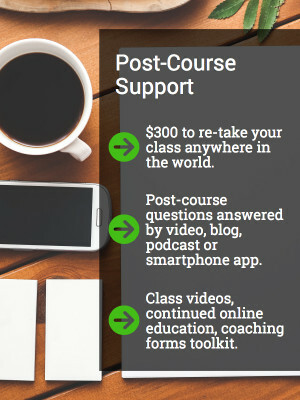 All of the detailed contents in this document will be covered during the course. The actual schedule is subject to change depending on the specific needs of the students, to assure the highest quality training possible, to promote maximum retention, and to maintain student energy levels, as well as the interest of each group. 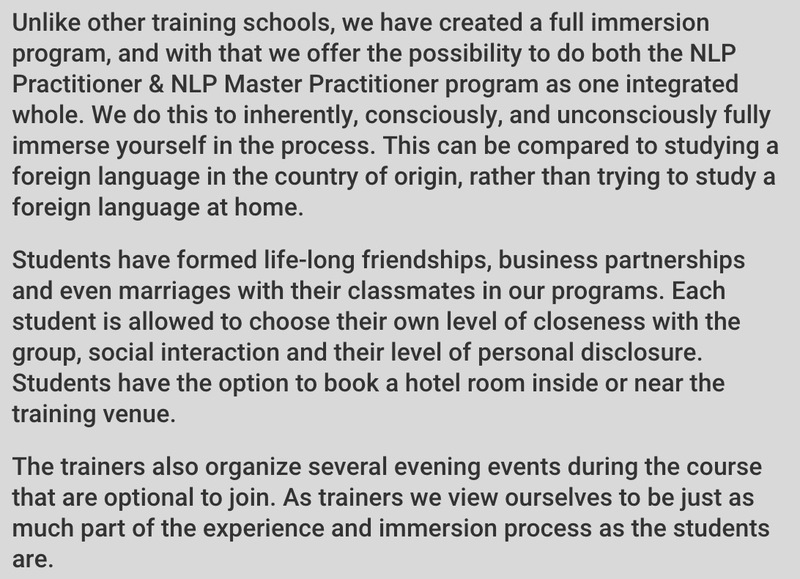 All Global NLP Training immersion programs have been designed under the premise that the brain can only learn when it is having fun, the mind is kept engaged, the body is comfortable and energized. 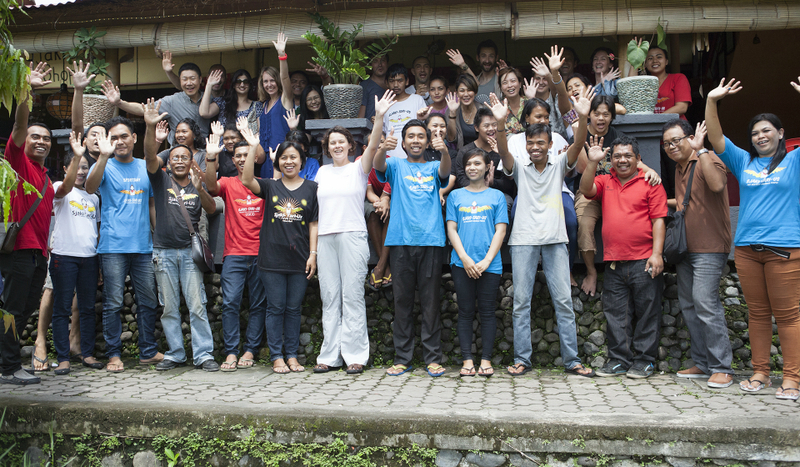 We work with highly skilled trainers, with a good sense of humor, whom aim to keep you riveted and engaged into a life changing learning experience. 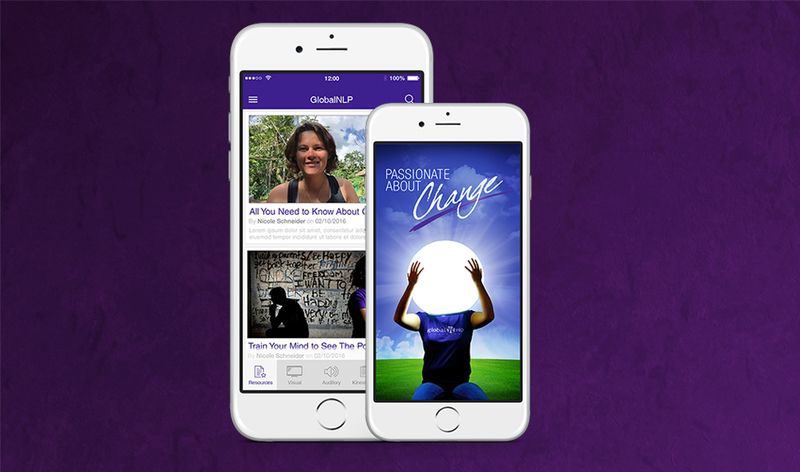 This training is experiential in nature, where coaching and NLP is learned by doing and actively applying the techniques on yourself as well as others. 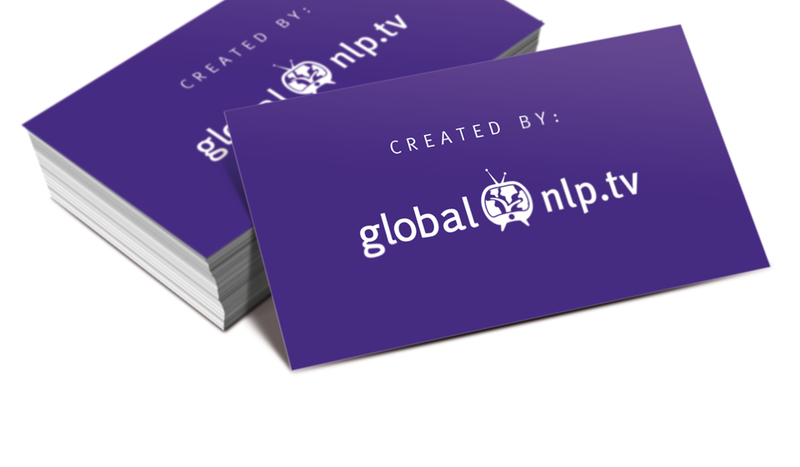 Global NLP Training’s programs, exercises and course content for the Global NLP Practitioner & Motivational Coaching, and the Global NLP Master Practitioner & Life Coaching programs, are proprietary and protected under Copyright. All rights reserved. 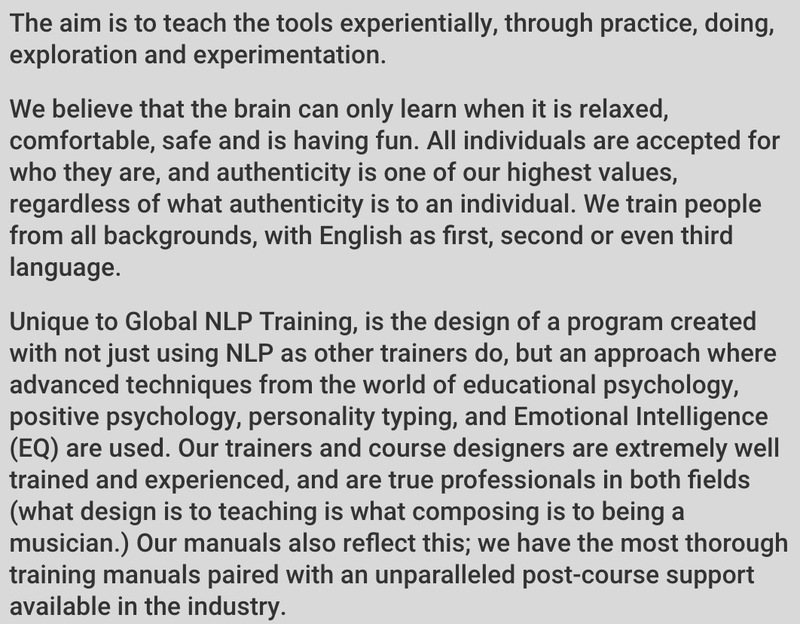 No portion of the program, training manuals, or exercises may be reproduced, stored in a retrieval system, or transmitted in any form or by any means – electronic, mechanical, photocopy, recording, scanning, or other – except for brief quotations in critical reviews or articles, without the prior written permission of Global NLP Training. 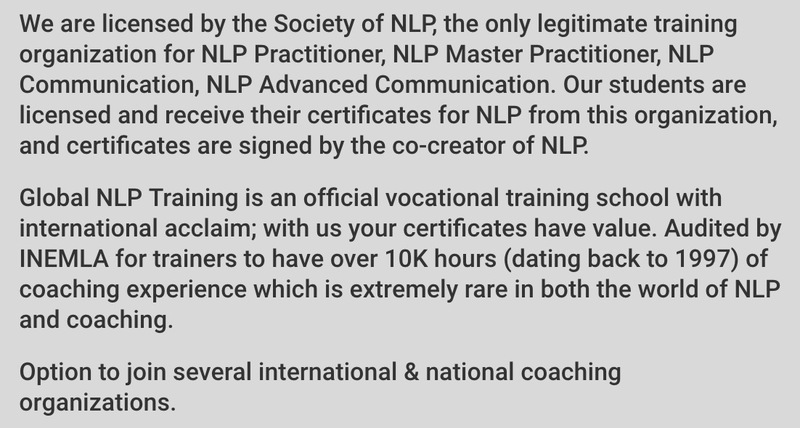 NLP Practitioner and NLP Master Practitioner licenses and certifications are copyright protected. 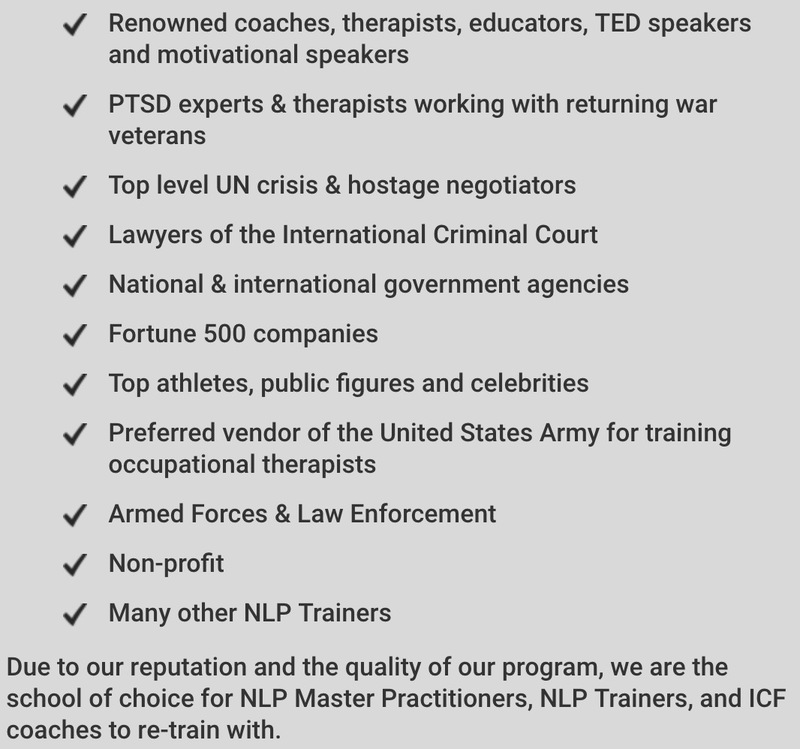 The training of licensed NLP Practitioners and NLP Master Practitioners is possible by completing and obtaining licensing through the official Trainer’s Training program. 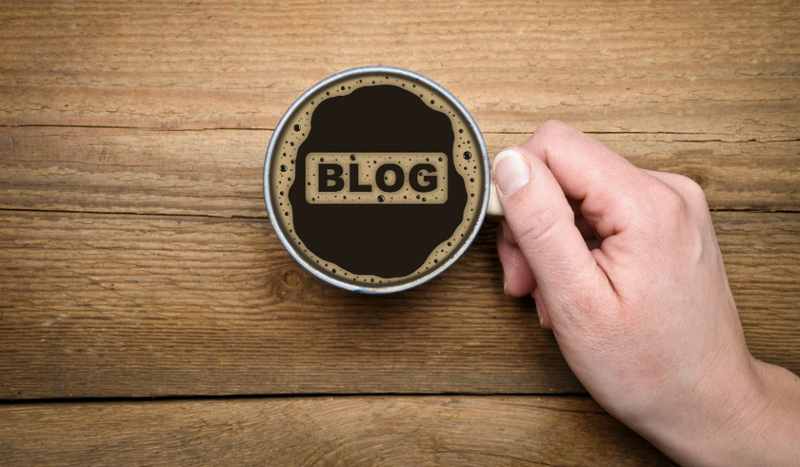 Deep structure vs surface structure – Information we give/conscious vs don’t give/unconscious. SWISH – Resolving habits like: nail biting, smoking, addiction, etc. Values and meta model questioning for life coaching.